I note with great interest not only news but also how they are distributed. I think it is a clear symptom of how we relate to what is happening, what aspects of contemporary history we see as a priority. Take for example the increasing escalation of the uprising in Libya. I just did a search on the net and it seems that in Italy and not only here, at least on the web, the shameful Berlusconi’s attitude before, during and after the current uprising, with the dictator Gaddafi inspire more curiosity than usual. I fully agree, needless to say. However, to be honest, it should be mentioned that the disturbing ambiguity of our country's relations with the Libyan leader was not born yesterday, let alone the day before, but has a more than a decade history. On the other hand, tell me what obscure guy of the last century we have had not relations with. The point is another, in my humble opinion. The point is that we speak of 10000 deaths (Updated 8.32 pm). 10000 innocent people killed in the public square, guilty only of enforcing their right to a free and democratic country. This noble culpable is still lacking in many of us, don’t you think? Us, on the other side of the sea. Us, observing all in one monitor, in the PC as TV screen, via the latest mobile phones. However, distance does not necessarily mean innocence. Not even guilty, okay, but responsibility does. Take a state called Libya, and imagine that it is totally in the hands of a leader named Gaddafi. Let's say it that in forty years he established a dictatorial regime that is guilty of despicable actions. Now consider another state, called Italy, and imagine that instead of Libya is considered free and democratic. About 720 dead go to Unicredit. 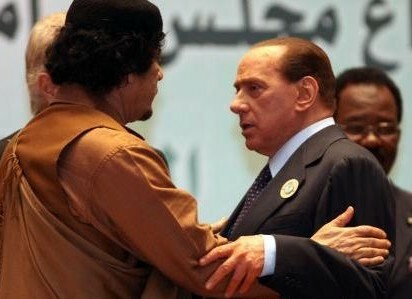 The News: Minister Frattini: by Gaddafi just rhetoric and falsehoods about Italy. + Protesters' about 2 / 3 - The country people '(anti-government) -> governments' innovation completely. " Approximately 1 / 3 'country people' -> compromise 'response'. + Authorities 'response' 'rights' (people). + Review: 'water quantity' 'against government' (Libya. ..) - how to resolve 'demanding' people. + 'Government' is not 'resolutions'' Security Council United Nations' (votes' absolute ') and' leader 'is not' banned movement. " + The 'link in the region' 'not opposed' (ie the Arab League, ASEAN, Africa ...). + A country (outside) no intervention. Number of coordinated water (shown: part - many 'people' World). + Prevent conflict (violence): 'government' and 'people - oppose'. + Response: 'government solutions' and (require) 'protesters'. + Intervention (external): 'solution' and stop (escalation) 'conflict' and 'faction' (in water). + 'Required' 'the government' (is): Negotiation - meet 'the people' -> stop 'intervention' (population: the decision). + Response: desire 'majority, World - purpose (' on ') (Section 4). + Do not 'responsible' build 'new government' (citizens 'decision'). + The (problem) 'conflict' Left: the 'UN' 'coordination' in every country and region. - Avoid (condition - in Libya), the protesters 'conflict' (assert basic 'human'). 'Government' apply 'the protesters' armed -> create 'force' rebel: repression. - Avoid: the wrong intervention (external) as 'constraints' (factors '4 '- Section 2) and ('4 Factors' section 4). - The solution (on the) 'did not happen Civil War' (by 'community' is not 'recognized' and 'isolation'. Government (will) meet the 'right people' and (will) 'no fear' 'protests'. Human civilization: to know - the unified 'solution' (above) -> is not 'civil war'.